UVI World Suite Instruments from Around the Globe www.uvi.net/world-suite.html — Epic collection of traditional and ethnic sounds — 50,000+ samples, 320+ instruments, 8,000+ loops and phrases — Intuitive UIs with instrument-specific controls Explore thousands of years of musical culture and traverse the most secluded corners of the world for inspiration with over 320 playable instruments browsable by region and type, and over 8,000 authentically performed loops and phrases. 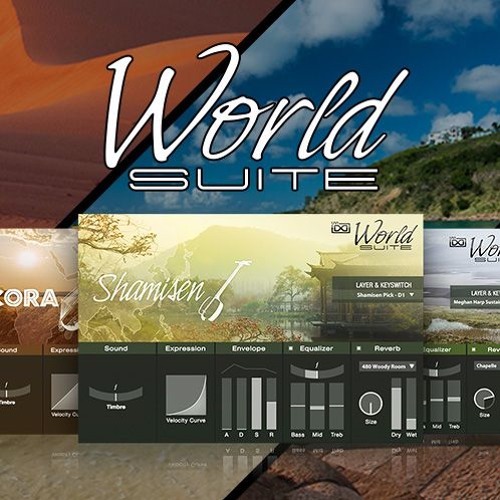 World Suite’s clear yet featured interfaces help you easily shape your sounds with instrument-specific controls including legato simulation, doubling, IR reverb and much more. World Suite also includes 9 unique ‘Traveler’ instruments that allow you to quickly mix, match, layer, edit and randomize loops and phrases to create countless sonic landscapes. World Suite represents an ambitious multi-year development designed to provide the ultimate ethnic instrument resource.